Institute's Stephen Curry fired home their opening goal against Larne. Institute maintained their recent good form with a comfortable win over bottom side Larne. 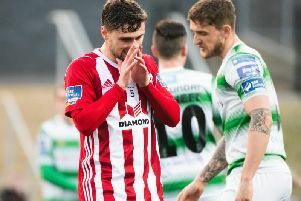 Paddy McLaughlin’s side, who are unbeaten in their last four league games, were always in control and ran out deserved winners, but they had goalkeeper Martin Gallagher to thank. The net-minder made a tremendous finger tip save when the game was still in the balance to deny Larne striker Daniel Reynolds. Another man who played his part in the success was skipper Michael McCrudden, he was at the heart of everything positive and he showed some neat skill and pass to Stephen Curry to fire home ’Stute’s crucial break through goal just before half-time. The Inver Park men, who were missing a host of players, weren’t helped when defender Kevin Bradley was rightfully sent-off in the first half, after picking up two bookable offences in a matter of minutes. ’Stute gave youngster Jake Morrow and Jamie Dunne a spot the starting line-up, replacing Caoimhin McCallion and Gareth Brown, who both dropped to the bench. The home side had the first real chance on five minutes as McCrudden’s well hit effort from a tight angle was saved by Larne keeper Conor Devlin. Unfortunately ’Stute were forced into a change minutes later with Brown replacing the injury Morrow. Larne should have went in front on 28 minutes as a slick passing move ended with Jerry Thompson’s left wing centre found David Abe, but the big striker blasted over. A minute later McCrudden was inches away from giving the home side the lead, but his 20 yard curling effort, which had Devlin beaten, clipped the crossbar. Just after the half hour mark Larne were reduced to ten men, as Bradley, who had just been booked moments later, rashly upended Dunne on the edge of the box, leaving referee Declan Hassan with little option to caution him for a second time before showing him the red card. Despite being down to ten men, it was the visitors who were inches away from taking the lead on 38 minutes as Reynolds saw his curling right footed strike from just inside the box, superbly tipped over by a fully stretched Gallagher. That save seemed to spark the Waterside men into life, as they took the lead on 42 minutes after some sublime trickery from McCrudden, ended with his lovely step over and pass finding Stephen Curry down the left and from a tight angle he slotted the ball past Devlin. Institute started the second half on the front foot and some last clearances and saves from Devlin, kept the visitors still in the game. However just before the hour mark, Institute deservedly added a second as McCrudden’s goalbound strike was deflected home by the alert Dunne. On 63 minutes, McCrudden was replaced by Ronan Wilson, but this change didn’t stop the flow of things, as ’Stute went in search of a thrid goal. Devlin had to make a top draw saves ten minutes later as Aaron Harkin’s right wing corner found Niall Grace, his powerful header was somehow kept out by the former Cliftonville net-minder. There was nothing Devlin could do on 75 minutes as a tremendous pass by Aaron Harkin released Curry down the right and his cross was headed home from close range by Wilson. Right at the death, Devlin’s miss placed clearance went straight to Dunne, but after controlling the ball and steadying himself, he blasted well over from close range. Institute: Gallagher, Morrow, Bonner, D Curry, Seydak (Scoltock 77); S Curry, Harkin, Grace, Dunne; Morrow (Brown 11), McCrudden (Wilson 63). Larne: Devlin, Bradley, Thompson, Chisanga (Rivera. 76), Fornah, Georgaklis (McCabe HT), Henry, Tolan, Reynolds, Abe, Stuart.